Embrace solar energy before global warming destroys the world . . . The Burning Answer. 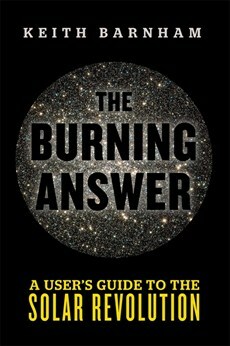 I have just finished reading Keith Barnham’s excellent non-fiction tome, The Burning Answer: A User’s Guide to the Solar Revolution. This is a book that every climate change denier and big oil executive should be forced to read before they go on TV to spout off about fracking and nuclear power and all the other crazy ways we have developed to power modern civilization. It starts off like a fascinating personal tutorial with Brian Cox, with author Keith Barnham explaining the physics of solar tech and the semiconductor revolution behind solar energy . . . explaining that Einstein’s E=MC2 might have kicked off the nuclear power race, but he developed another equation that we will need to embrace if humanity isn’t ultimately to end up boiling in its own industrial juices: E=hf. Moving on from the basis of the underlying physics, with the best definition of the difference between power and energy (and so many politicians’ muddled thinking) that I have ever read, he takes us on a whistle-stop tour of the current state of the renewables field, potential future developments, practical advice for householders wanting to install ground storage and solar panels, and why countries like Denmark have beaten us to the punch on exploiting the free energy that falls from the sun every day. The Burning answer also covers the issues of energy storage, fuel-cell transport, making energy from CO2, blue-sky developments such as artificial photosynthesis, and what a Manhattan Project to lead a green energy step-change might look like. Of course, much like Deng Xiaoping’s Dengism . . . “It doesn’t matter whether a cat is white or black, as long as it catches mice.” . . . I don’t care what frees us from planetcide. Just so long as something does! « Early cover concepts . . . Foul Tide’s Turning.